For many days already, I owe two ladies in the blogosphere a big thank you for rewarding me with the One Lovely Blog/Very Inspiring Blogger Award. The first was G. from Lin3arossa, followed by Red Point Tailor. Thank you! I know that some bloggers don’ t publish their awards and don’t participate in sharing random facts about themselves and at first I decided to keep it simple as well, until honingdesign (Thank you too!) nominated me once more. 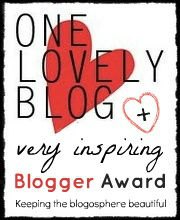 Add The One Lovely Blog Award /The Very Inspiring Blogger Award to your post. Hmm, 7 things about myself…. let me try. I love picking mushrooms and berries in Estonian forests in summer. So relaxing and rewarding! I got my driving licence in Cyprus, where they drive on the left. Silk, Lace and Steel – a blog that is just starting up, but I have been keeping an eye on Jiulia’s creations on Burdastyle and love them all! Jorth – I love the sewing and admire the knitting this lady does! I am naming only nine, I hope this violation of rules will be forgiven. Forgiven! And so many languages! I’m impressed (and somewhat envious, I admit)! Thanks! Some new to me blogs there, I love finding new ones. Thank you so much for this award, they are always a great way to discover new blogs, I’m off too check out the ones you listed and will link to your great blog in my next post. Thank you! I love your new red dress, by the way!